LOS ANGELES, Jan. 11, 2019 — (PRNewswire) — Disney's highly acclaimed a cappella group, DCappella, will kick off its 40-city North American tour on January 22nd, 2019 at the Florida Theatre in Jacksonville, FL. Following several hundred submissions on social media for #TakeMeOnTour, vocal performance groups – including a cappella, chorus and barbershop – have been selected to serve as the opening act on each stop of DCappella's 2019 tour. The tour features a contemporary production of new Deke Sharon ("Pitch Perfect" films, Straight No Chaser) arrangements of Disney classic and modern hits, bringing to life a truly unique a cappella experience. Sharon ("the father of contemporary a cappella," according to Entertainment Weekly), is DCappella's co-creator, music director, arranger, and producer. 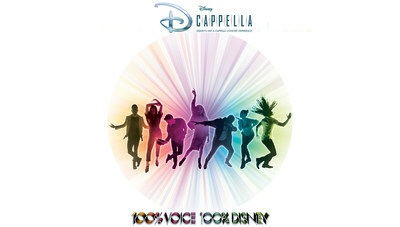 Fans can expect to hear over 30 classic Disney songs performed a cappella in a wide range of styles and grooves. Giant high definition video screens with original film content wrapping the stage will immerse the audience into an exciting audio visual experience. Known for their reimagined classics from the Disney songbook, the seven dynamic voices that make up DCappella, Sojourner Brown [alto], Orlando Dixon [baritone/"The Voice"], Antonio Fernandez [vocal percussion], Morgan Keene [soprano/"Newsies"], Shelley Regner [mezzo/"Pitch Perfect" films], Joe Santoni [bass], and RJ Woessner [tenor], represent a first for Disney, who launched the brand's flagship a cappella experience last Spring with a TV debut on "American Idol" during "Disney Night," where the group performed classics from "The Little Mermaid," "Beauty and the Beast," "The Lion King," and "Aladdin." That same week, they graced one of Hollywood's most hallowed stages to open Disney's Beauty and the Beast Live in Concert at the Hollywood Bowl. Most recently, they performed on two ABC specials, "The Wonderful World of Disney: Magical Holiday Celebration" and "Disney Parks Presents a 25 Days of Christmas Holiday Party." DCappella's self-titled debut album is available via all digital and physical retailers. For more information on the opening acts, please visit DCappellalive.com.